I loved the Aisling Grey series, the Silver dragons was okay. I'm having a hard time finishing this one. The stupid cute is leaning too far to the stupid for my taste. Tully's characterization is too much like Aisling. I love the narrator, but she needs to be edited for the swallowing and mouth full of saliva sounds, it's distracting. This lack of editing is a production fault, not Audibles or the writers or the narrators. Lazy, poor production. I think the biggest fault for me is the story at this point. If/when I finish I'll bump up or down my rating accordingly. 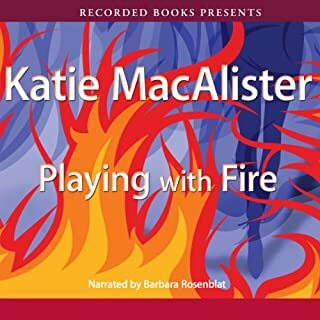 I really enjoy Katie MacAlister and generally enjoy Barbara Rosenblat's performances, but I just started this one and I must say it is EXTREMELY irritating right now. Editing the mouth noises!!!!!! None of the previous books have been this irritating with squishy, watery mouth noises from the narrator. My favorite Dragons- the Light Dragons! He is not a fat dragon! In Love in the Time of Dragons, we meet Tully who is the resurrected Ysolde de Bouchier, mate to the dreaded ex-Black Dragon wyvern Baltic. Tully is suffering from severe memory loss. In order for Tully to fully regain her memory so she can either accept or reject her identity as Ysolde, she seeks out Baltic to answer her questions and all heck breaks loose. 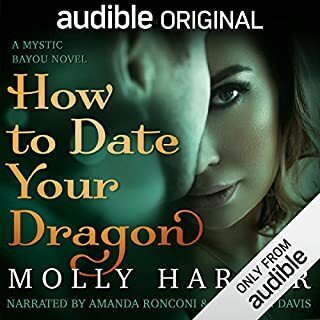 This is the first book in the Light Dragon series, but this plot calls heavily on characters and plots from earlier books in the Aisling Grey series and the Silver Dragon series. Most of the reoccurring characters are back including Jim who is present in a big fat Newfoundland way. 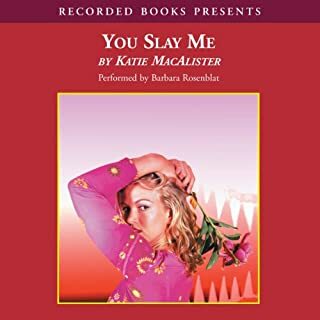 Katie MacAlister’s heroines are always comically flawed, and Tully/Ysolde de Bouchier does not break from this pattern. 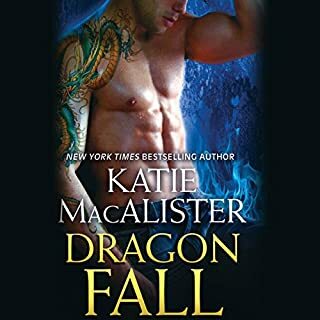 As with all of Katie MacAlister’s books, Love in the Time of Dragons contains her offbeat, slightly Three Stooges infused sense humor and is a joy to hear. This is a fantastic book, and Barbara Rosenblat is as wonderful as she always is. Keep the dragons series going!!! Love this books flashbacks. Putting the dragons past togethor is wonderful. My favorite non person is in this book too...love our furry demon! Nice end..keeps us wanting more. Enjoyed this soo much I could listen to it again. The story was okay but I did not think it was worth a five star. It was a bit flat and without any excitement. This book is the first in the series but the story did not finish leaving the next ones to complete the rest but at this point I’m resigned to not knowing the end. I’m just glad it was a book on sale. This is a follow on from the last Silver Dragon's books but what a change in style. I thoroughly enjoyed that series but this one - not so much. It seems K.Mac. has gone more for the comedy aspect in this new series. It has romance but she seems to skip the love scenes, which were part of the Silver Dragons appeal. It was humorous but I am struggling to get through book 2 and keep stopping to listen to another book altogether. The narrator was good but someone please give her a drink.... she sounded like her mouth was dry all the time, and the swallowing sounds were offputting. Worth the credit? If, I hadn't already downloaded 2 and 3 then a definite No. What did you love best about Love in the Time of Dragons? Love the premise of the main character discovering who she really is and her prior affiliations. The narrator was just annoying. Her voice cuts right through me all of the time regardless of what character is speaking. The swallowing was very distracting. I've persevered hoping that the narrator would grow on me as others have. I'm within an hour of finishing the book, but I'm actually talking aloud to the narrator at this point just wishing it were over with. If I live through this, I won't be listening to the other books in the series because of the narrator. I might read them instead if I still care about the characters in the end. 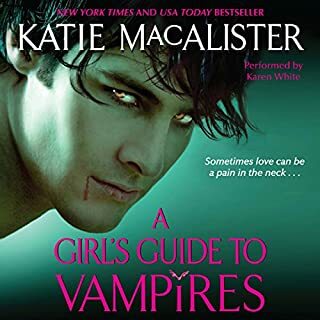 I love Katie MacKalister's books and have listened to several and enjoyed them, but not by this narrator. The narrator makes gross swallowing noises after every one or two sentences. It's distracting, but the variety of voices she can make are impressive. This narrator needs to STOP THE CHEWING while she is recording! She sounds like a COW CHEWING HER CUD!! This horrible nasty sound makes the book nearly impossible to listen to!